The last competition of the 2017 domestic calendar took place at Fenton Manor over the weekend of November 25th and 26th. 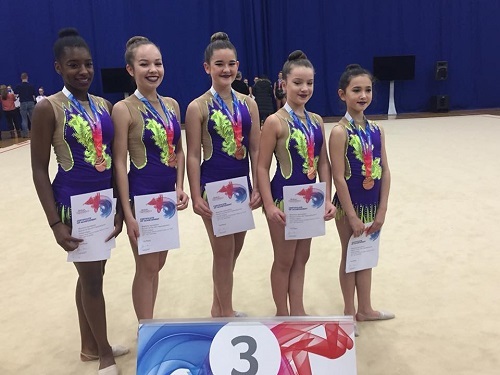 Six titles were at stake in the Espoir Open Individual Apparatus Championships, with Round 3 of the various Group Leagues forming both a stand-alone event and the final chance for gymnasts to claim medals in the overall Group Leagues. 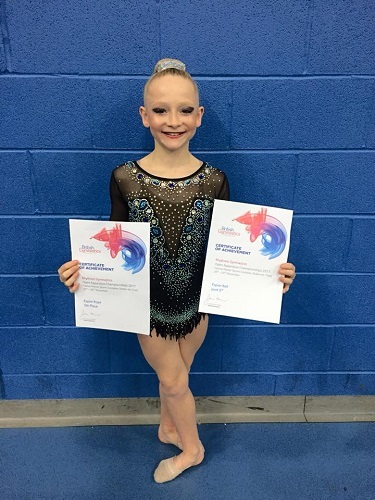 The City of Birmingham’s Prisha Rai took the Clubs title in the Espoir Open Individual Apparatus Championships – her first success at this level. Worcester’s Georgia Smith finished a very creditable 5th in the Rope section and joint 6th with Ball. 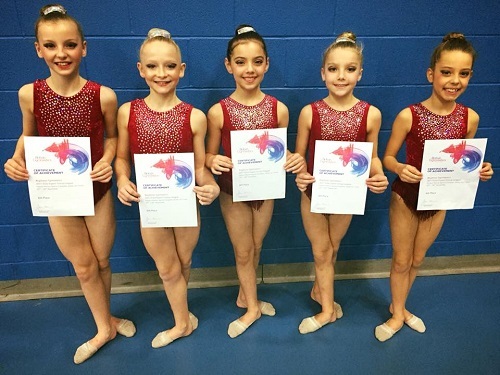 The City of Birmingham Stars (Francesca Barker, Daisie Burke, Emily Hawkins, Amalie Howard and Alarna-Jai Turton) once again dominated in the Elite Junior section. They posted the highest scores for both their Rope and Clubs routines to win Round 3, and comfortably retain the League title they won in 2016 – a fitting finish as this was their last competition as a group, with Fran and Emily ‘retiring’ after this event. 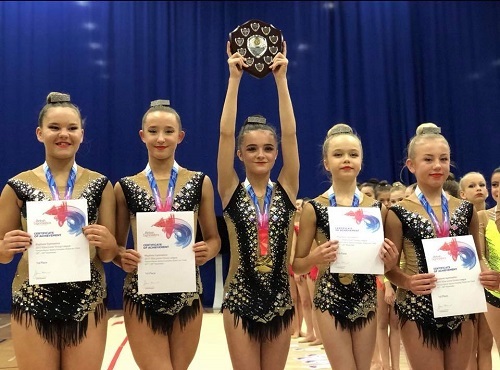 The City of Birmingham Pearls (Jessica Dodd, Camone Gordon, Millie Jordan, Miya Walker and Olivia Whatmore) pulled out their best performance of the season to win Round 3 on the day and claim 3rd place in the overall National Junior Group League. The club’s success continued with the City of Birmingham Thorns (Nicole Allen, Jess Bateman, Sophie De-Bear, Tash Hodson and Lauren Moult) finishing 2nd in both Round 3 and the overall Senior League. 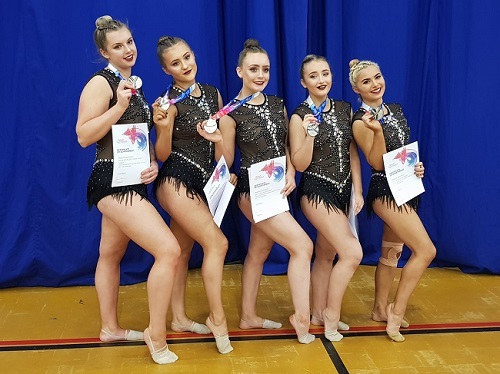 In the younger age groups, Worcester’s Elite Espoir Group (Mia Harding, Lucy Jackman, Elodie McNelis, Georgia Smith and Eva Yordanov) didn’t have their best competition, but still did enough to claim 6th place in the overall Elite Espoir League due to strong performances in the previous rounds. The City of Birmingham Gems (Ayumi Dunbar, Hannah Jordan, Tia King, Tasia Murray, Allie Neal and Aavni Patel) finished 6th on the day 8th overall in the National Espoir League and the City of Birmingham Sparkles (Amelia Baird, Tia Chambers, Rebecca Dishova and Emma Iankova) were 11th on the day and 10th overall. Congratulations to everyone on a very successful end to 2017. Now the hard work starts again for 2018!